The growing problem of illegal trafficking and counterfeiting of cigarettes is largely driven by economic factors: when overall cigarette prices increase, the incentive to illegally traffic cigarettes also increases. The U.S. Treasury Department recently acknowledged that an increase in the federal excise tax on cigarettes (such as the 156% federal tax increase, which passed on April 1, 2009) creates “a greater incentive to evade federal taxes.” The current, poor economic climate only exacerbates the issue, increasing the temptation of lucrative opportunities to participate in illicit schemes. 1. Criminal penalties for cigarette tax evasion are low enough that traffickers and counterfeiters simply consider it a cost of doing business. 2. Cigarette trafficking can occur at all points along the normal production and distribution channels, with cigarettes being diverted outside normal commercial streams and into the black market. The result is a widespread problem: the U.S. Treasury Department has linked illegal tobacco smuggling and counterfeiting to organized crime and funding for terrorist groups. According to a report from U.S. Rep. Peter King (R-NY), Al Qaeda, Hamas, and Hezbollah are among the groups believed to facilitate global illicit tobacco trading to finance their activities. 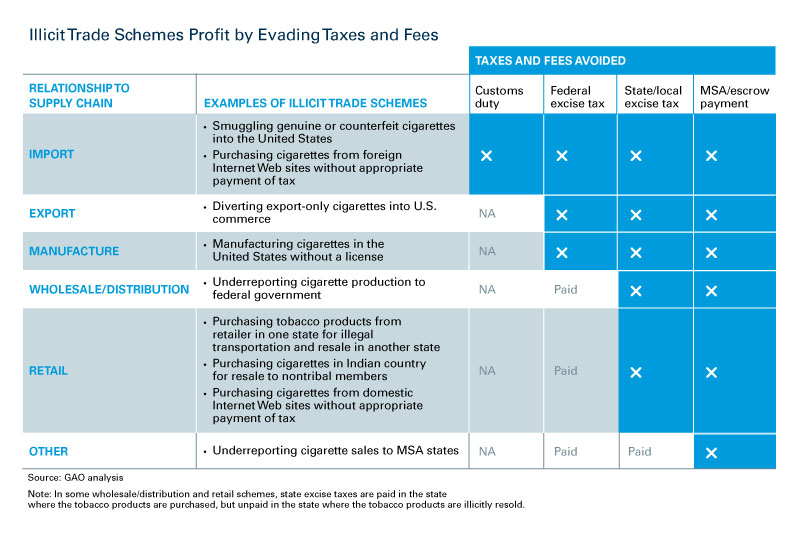 State governments are among the entities most directly impacted by cigarette tax evasion, as excise tax stamps are a significant source of revenue, and the cost of failing to collect that revenue is enormous. 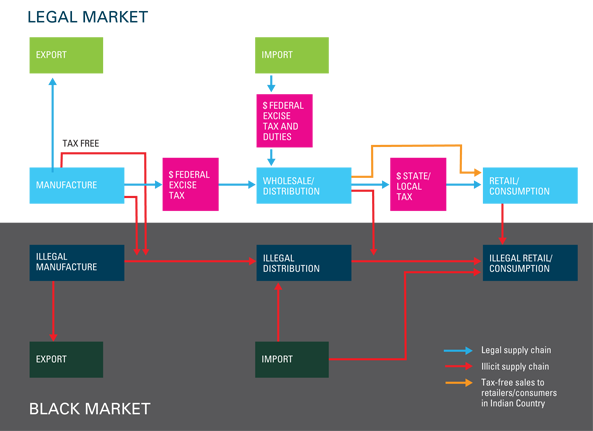 The U.S. Treasury Department also recently estimated the potential profit margin of the illicit tobacco trade in New York City – avoiding all taxes and applicable fees – at approximately $3.2 million per truckload. In 2002, the Internal Revenue Service (IRS) estimated that state excise tax losses on cigarettes were approximately $1.1 billion for the year. And the problem is only getting worse: in 2009, the ATF indicated that states were losing an estimated $5 billion annually in cigarette tax revenue. 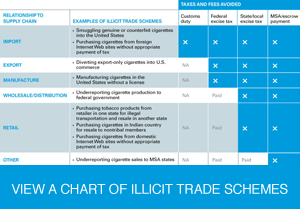 *Chart adapted from the US Government Accountability Office Report to Congressional Committees - ILLICIT TOBACCO, Various Schemes Are Used to Evade Taxes and Fees, March 2011.